April 16, 2010, Toronto - CISION, online. Verdemed is proud to sponsor The Latin America Regional Cannabis Report: 2019 Industry Outlook (New Frontier Data). “The purpose of the report is to provide an overview of cannabis legalization and regulation trends and issues in key Latin American markets in order to support operators and investors in guiding business strategy for emerging sectors.”. January 11, 2019, São Paulo - O Globo, online. Two executives from Wayland Group, a Canadian company that sells cannabis-based products, are in Brazil to make a proposal to Verdemed, a start-up that includes Brazilians among its founders. Wayland wants to buy 10% of Verdemed for US$6 million. Focused on cannabis-based products, the company is valued at US$54 million. For Wayland, which has operations all over the world, the main appeal of Verdemed is its operations in Latin America, especially in Brazil and Chile. The plan, which is still at an early stage, is to fold it into a new company of global scale, to be created by Wayland. The discussions are serious and, if it succeeds, the deal should close before Carnival, which this year takes place in March. December 02, 2018, São Paulo - O Globo, online. 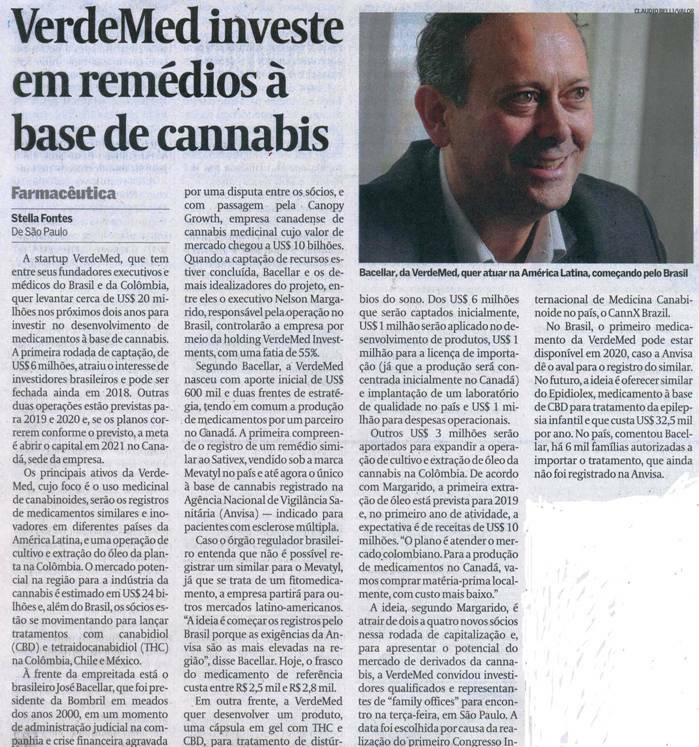 […] Bacellar met with other Brazilian executives and doctors to set up Verdemed, a medical cannabis company. Since then, he says, he spends half the time in the air: between Chile, Colombia, Uruguay, Mexico, Brazil and the United States. Before opening the business, he still spent three months in London at an internship following biotechnology laboratories applied to medical cannabis. Your company takes care of everything from planting to delivering medicines to patients.…. Verdemed invests in cannabis-based medications. November 12, 2018, São Paulo - Valor Econômico, in print and online. VerdeMed, among whose founders are executives and doctors from Brazil and Colombia, plans to raise about US$20 million over the next two years to invest in the development of cannabis-based medications. The first funding round, with a goal of raising US$6 million, attracted the interest of Brazilian investors and may be concluded in 2018. Another two rounds are planned for 2019 and 2020 and, if progress is as scheduled, the goal is for an initial public offering in 2021 in Canada, where the company’s headquarters are located.…. In Brazil, marijuana startups wait for change in legislation to act. October 14, 2018, São Paulo - O Estado de São Paulo, in print and online. Despite drug commerce being illegal in the Country, companies created to explore the medicinal use of the substance attract investors. October 2, 2018, Toronto - CISION, online.